Yay! A recipe post!! I know it’s been for.ev.er since I’ve shared a recipe post on here (three months ago, really?? ), but between the huge kitchen update and basic summer happenings I am just now getting back into the kitchen. It feels great to work in our “new” space though so I’m excited about sharing regular recipe posts with y’all again, I promise! 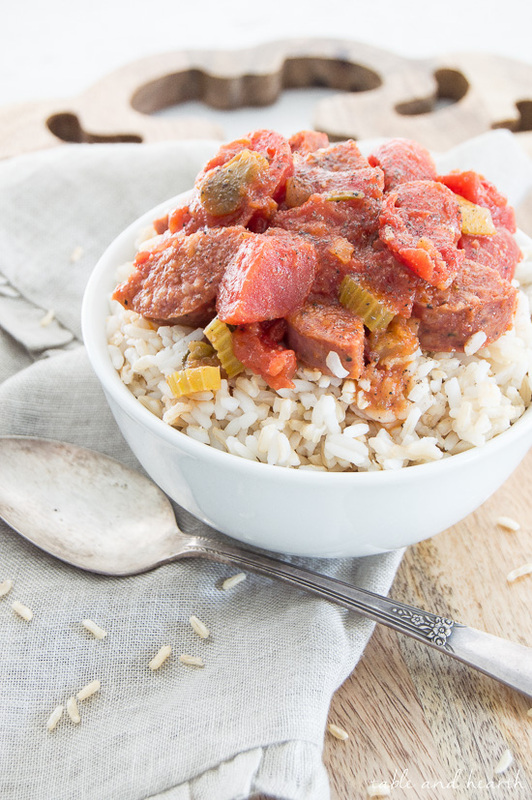 Today’s recipe is one I’ve been wanting to recreate for years now, my father’s famous “goulash” recipe. Now, I know what I’m calling goulash is not at all what traditional goulash really is (it usually consists of beef, elbow macaroni, and tomatoes in more of a stew/soup form), but it’s what my father called this dish so it’s what I know it as. 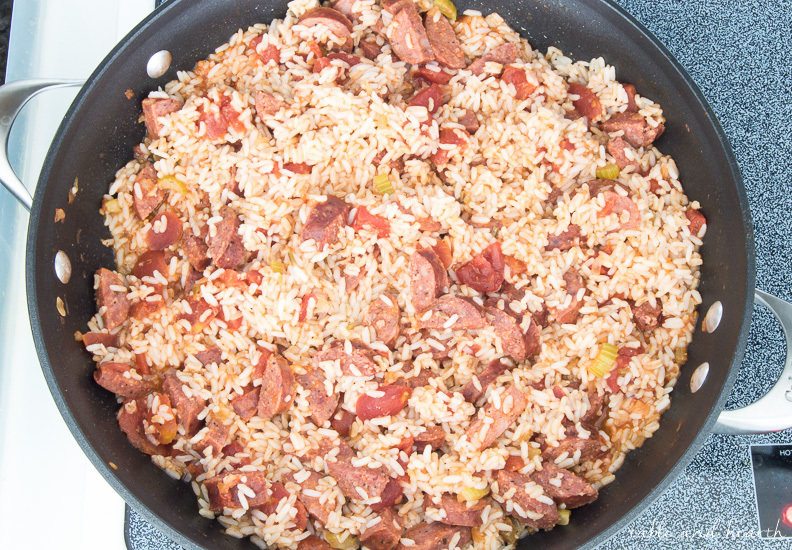 Really, it’s just simple sausage and rice. When he was in charge of dinner growing up I would usually get this and he was so SO proud of it, and I loved it too so I made it well into my bachelorette college days. I am happy to jazz it up a little and share it with you guys now! 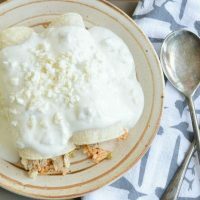 The key to what makes this recipe such a hit is how freaking easy it is, just a few ingredients and it’s quick. 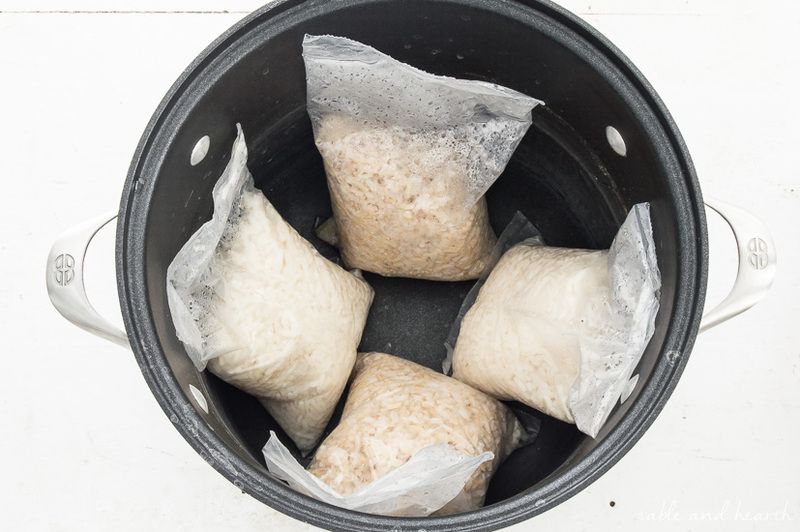 I ALWAYS use boil-in-bag rice for this dish instead of regular rice because it is so much more convenient. 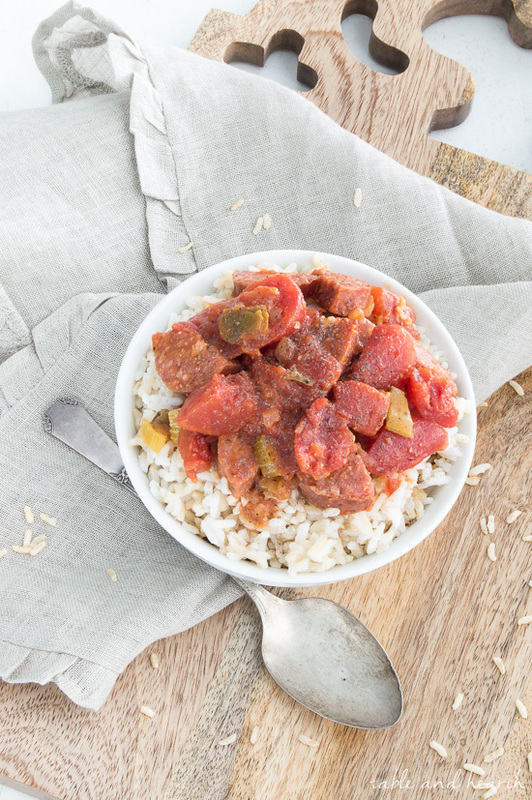 Why spend so long cooking standard brown rice when you can get the same taste and nutritional benefits in 1/4 of the cooking time? Sign me up! 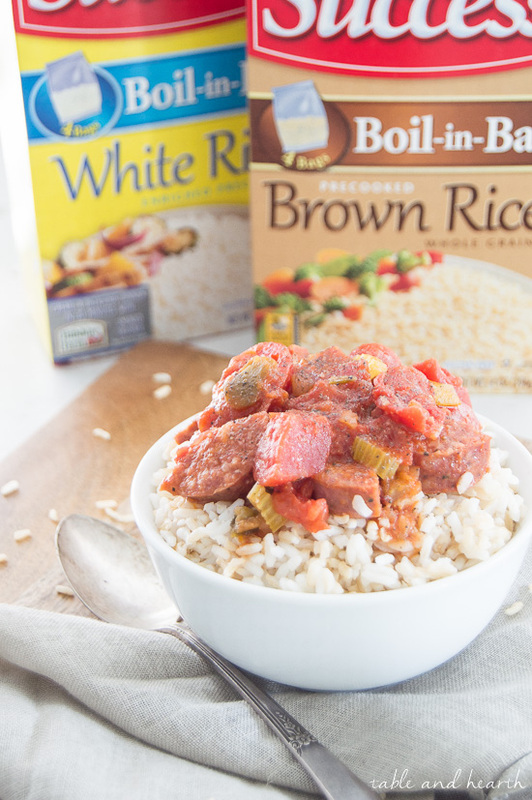 I love to mix the two textures of white and brown rice, it just brings a little more interest to the dish and I like the little crunch of the brown rice. 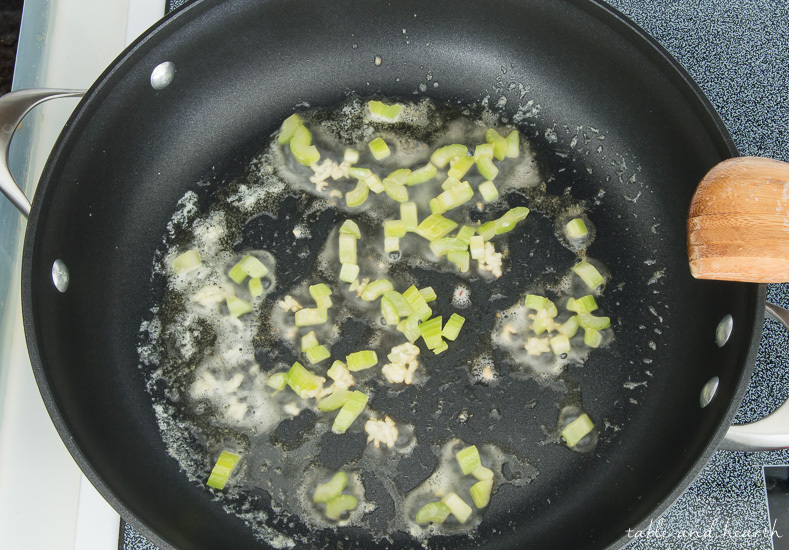 For the veggies, I like to use a little bit of celery for some color and usually also throw in a handful of finely diced onion too although I was out this time. Whatever you do use, it will get sauteed in some butter with the minced garlic for a few minutes until they soften up a little. 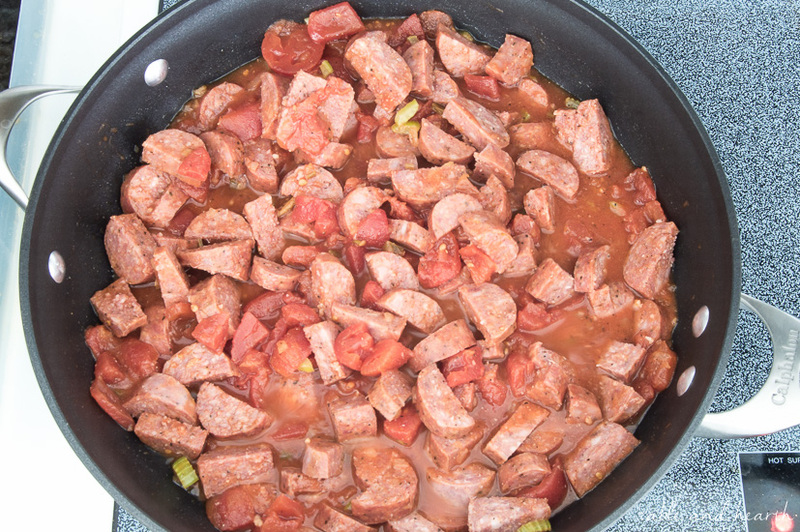 Add the sliced sausage and two cans of stewed tomatoes. 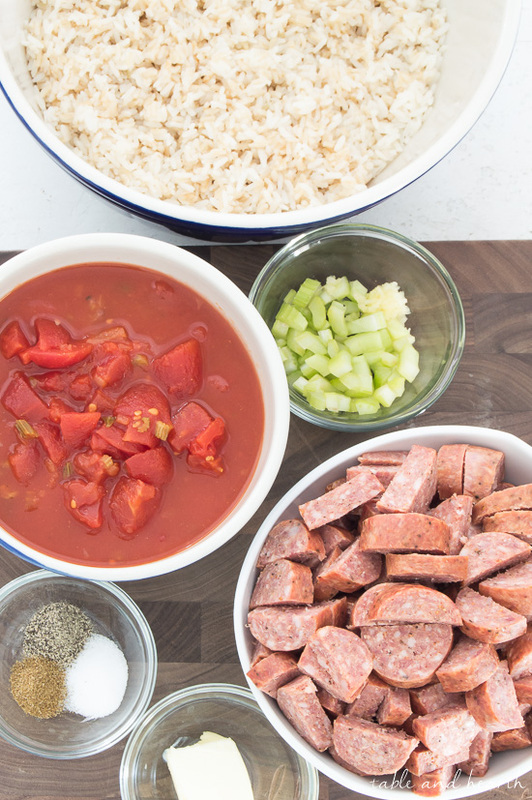 You can use whatever kind of sausage you like but we feel the dish tastes best with some sort of smoked or Polish sausage that holds its shape well. Using some that is already fully cooks of course saves some valuable time in the dish. 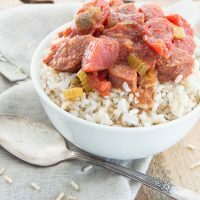 You can also use various types/cuts of tomatoes as well but I love the seasoned flavor of the stewed tomatoes and how they meld so well with the rice in this dish so that’s always what I use. I like mine really tomato-y and actually wish I had added one more drained can to this batch :) It’s really easy to just adjust the amounts of certain ingredients to whatever your preferences are. 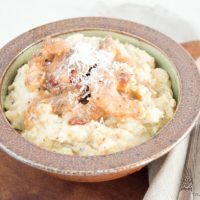 It’s even better the next day when the flavors have time to all blend together, which is even greater for a weeknight meal. Get more nights out of it PLUS it tastes better and better! I’m so excited to start making this dish more frequently again now that it’s got a slightly fancied up version. It is probably the quickest dinner dish I know of, right up there with spaghetti…but MUCH better! 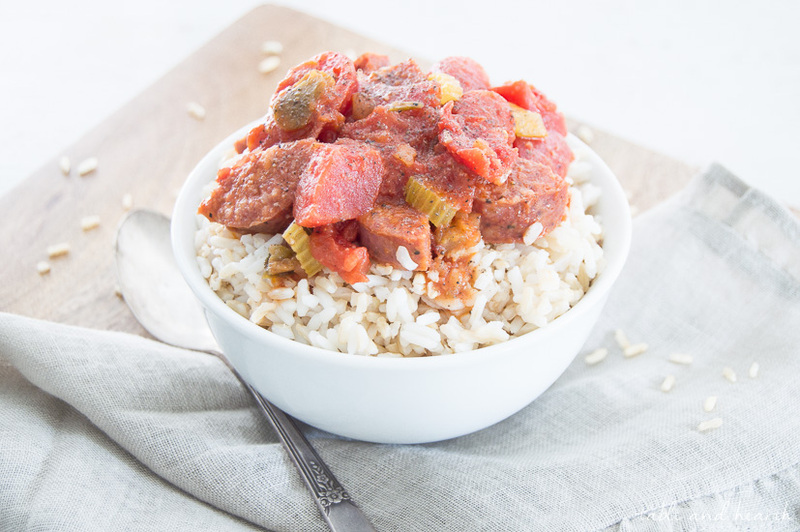 This quick and easy dinner dish is perfect for busy weeknights and tastes even better as leftovers. It's a family classic! If you can't find the Mexican-style stewed tomatoes, you can use normal ones and add some sauteed diced jalapenos or green chilis to the mixture along with any Mexican spices such as chili powder and/or more ground cumin. Oh my gosh! This looks SO yummy! This looks easy and so good! 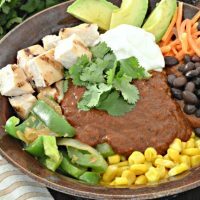 I’m always looking for easy weeknight dinner ideas and will definitely try this!